Stocked and available in Canada. 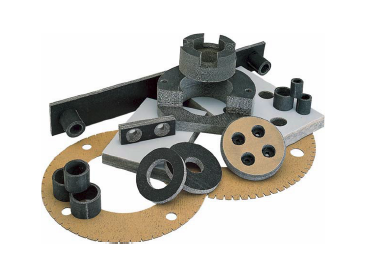 Fabreeka’s vibration and shock isolation materials can be supplied in the form of sheets, cut pads, washers and bushings for OEM applications. The properties of our products are specifically designed for the reduction of impact shock, vibration isolation and structure-borne noise reduction. Since 1936, Fabreeka has worked with original equipment manufacturers in a variety of industries and applications where absorption of impact shock and isolation of transmitted vibration is desired. Fabreeka pad material can be easily die cut and provided with counterbore or countersunk holes, chamfers or radius edges. Materials can be manufactured with a PTFE (Teflon®) surface to provide a lower coefficient of friction or thermal insulation when required. Can Fabreeka pad be supplied in the geometry I need for my application? Yes, the product can be configured to most geometric shapes. What do you recommend for cutting Fabreeka/Fabcel pad material in the field? Fabreeka pad can be cut by using a band saw with a fine tooth, narrow angle saw blade configuration. Fabcel pad can be cut using scissors or a fine tooth saw blade. Holes can be cut using a fine tooth, narrow angle hole saw. What adhesive do you recommend to bond Fabreeka/Fabcel pad? #700 Epoxy is recommended for Fabreeka pad. 2240-05 Cyanoacrylate is recommended for Fabcel pad. What are the manufacturing tolerances of Fabreeka/Fabcel pad? Manufacturing tolerances vary by thickness, part geometry and material. 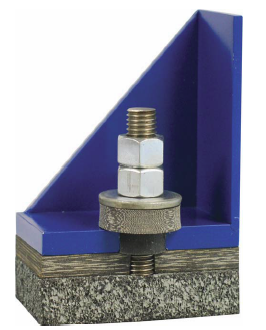 Please contact our Engineering department at 800 580 4195 to discuss the tolerances for your application. Using an average of 1,000 psi, and depending on load, the coefficient of friction of Fabreeka pad on steel is 0.4 and the coefficient of friction of Fabreeka-PTFE on steel is 0.06.